Oh, the last week of my June of Jane inspired books has arrived. There really are an untold number of ways of how modern authors have taken their own spin on Jane Austen and the five novels she penned. But of all the four I’ve taken a look at this month I have to say, this one is my favorite. 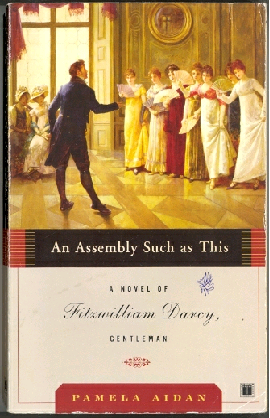 Pamela Aidan’s Fitzwilliam Darcy, Gentlemen Trilogy. I am not alone, in think, in believing this is one of the best Jane Austen Fan Fiction works out there. In the realm of the Janites I have heard Ms. Aidan referred to simply as “Lady Pamela” and she earns it. So what is The Fitzwilliam Darcy, Gentleman Trilogy? Well, it is simple in concept. It is Pride and Prejudice entirely from Mr. Darcy’s point of view. I know, several people have done this…I’ve read others…and I’ve cringed at the description of even more…but this series truly is the top run of Austen Fan Fiction. I have to say, I think what really sets this book apart is Lady Pamela seeks not only to bring you into the mind of Darcy, but also into his world. The world of a man in the time era, as you might have heard, was a great deal wider and freer than that of a woman, especially a woman living in the country. So while Jane strove to tell us about the life of a gentleman’s daughter living in a small town with only the hope of finding more, Lady Pamela brings us in to the world of a man of influence, who travels across the country widely, from the ballrooms of London to the borders of England and has his hand in everything from international intrigue to the height of fashion. The Gentleman Trilogy gives cross sections of a number of cultures, movements, beliefs, and events that would have paralleled a man like the great Mr. Fitzwilliam Darcy. And so in the end you have a story that we all love…Just with a lot more details!!! Lady Pamela is quick to note that Mr. Darcy is in fact absent from a considerable portion of the original novel and she simply wished to know what he was up to. ;) Well, don’t we all? I have sought, in previous posts this month, to introduce books that both the Jane and Non-Jane fan alike could find something in. But I must admit, this series is really a feast for the true Jane lover. It just so happened that I found it shortly after I reread Pride and Prejudice for a class and I think that made the experience even more enjoyable. I could see all the fine attention to details. I order, the books are: And Assembly Such As This, Duty And Desire, These Three Remain. Now you must tell me, are you a fan fiction reader? Do you even know much about fan fiction? Next > Probably the strangest book series I’ve ever read. Fan fiction writer, actually. ;) I write short stories/poems; most of mine haven’t been in any way published, although I have a couple of (cringe-worthy) works (teenage attempts) still on fanfiction.net. I primarily write about characters who intrigue me, when I feel they have not been done justice by the author, or when a dimension of them has been hinted at, but not developed. I love reading good fanfiction, (the vast majority does not fall into that category, in my opinion) and now I really want to read the trilogy you just made sound so fascinating. Has anyone read “Sanditon”? (By Jane Austen, and Another Lady) It is the best example of good Jane Austen fanfiction I can think of, especially since it’s partly written by Jane herself, who left it incomplete at her death. Ah, you write fan fiction! I’ve always wanted to give that a try. It’s true, there are characters that just don’t get the justice they deserve, often in Austen fiction actually. I didn’t know someone got around to finishing Sandition. I own the original, but I’ve never read it because, well, there was no end. :P Thanks for letting me know. At great personal risk, I must confess I don’t like Jane Austen novels. They’re right up there with Shakespeare.